Former Alaska Gov. 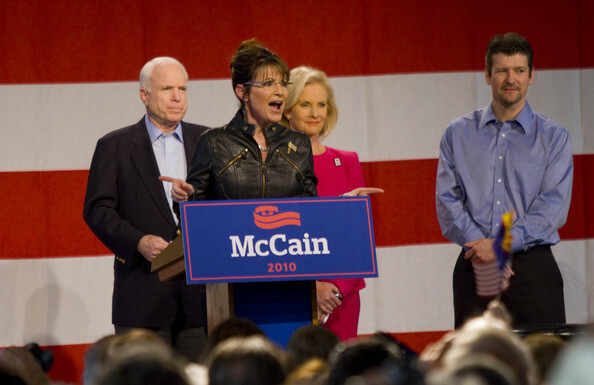 Sarah Palin speaks as U.S. Sen. John McCain (R-AZ) (L) his wife Cindy McCain and Palin's husband Todd Palin look on during a campaign rally at Pima County Fairgrounds on March 26, 2010 in Tucson, Arizona. The former governor traveled to Arizona to stump for McCain, who is facing a primary challenge in his bid for a fifth term in the Senate. Today's event marked the first time the pair had campaigned together since their failed 2008 presidential run.